Knots are a part of the fabric of our every day. Whether tying our shoe laces, untangling a necklace or ear phones, or putting the final touch on a bow-wrapped package, they are all around. This persistent presence of such a functional item ignited an interest and journey in artist Windy Chien to elevate knots from the functional to the beautiful. The challenge and journey of expanding her knowledge and command of knots led Windy Chien to submerge herself in the ancient, nautical craft of knot making – learning a different knot each day for one year. Knots have become her language; a celebration of the intersection of aesthetics and functionality; a way to bring into the present an artform of the past. By placing knots in new and unexpected contexts, they are transformed into something more than rope, something special, something that speaks. Blurring the lines between fine art and artful interior design, the knots remind us that even the smallest and most forgettable moments can be elevated into something unexpectedly beautiful and functional. Sunbrella is pleased to present Knot Expected: Elevating the Everyday. Like Windy, we believe in and celebrate the bliss that is unleashed when beauty and functionality come together to create a new feeling and story. You can’t tie a knot without fabric, and that interwoven reality created the perfect synergy between Sunbrella and the art of Windy Chien. 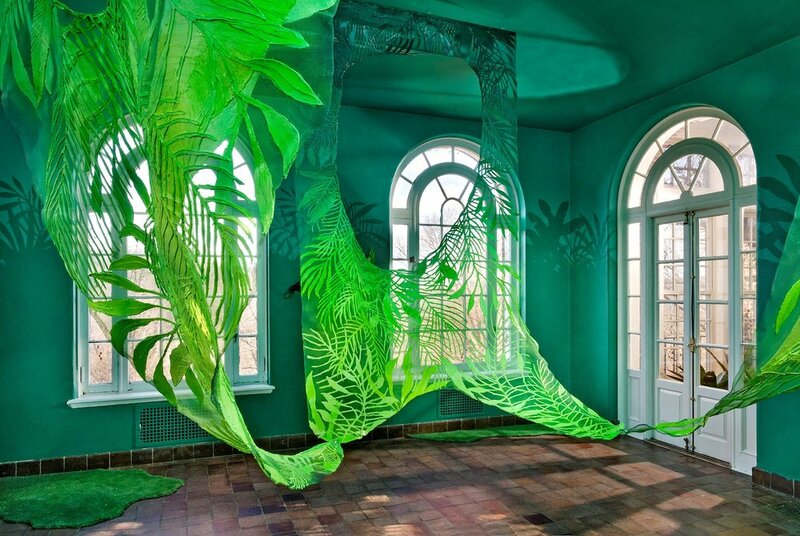 Origin: Fictions of Belonging is comprised of tactile, draping sheets of intersecting palms and leaves on wire mesh that hang from the ceiling like a rainforest canopy. Its presence and transparency explore the physicality of invisible boundaries that exist between us -- ‘veils’ as discussed by W.E.B. DuBois in The Souls of Black Folk. The work also taps into the imperialistic impulse to explore and the notion of discovery that created an appetite for tropical narratives. Male western artists such as Henri Rousseau and Paul Gauguin exoticized non-European environments and inhabitants resulting in problematic and exaggerated ideas of otherness. The overly saturated, non-specific, tropical greenery of Origin: Fictions of Belonging calls attention to the faux narrative and questions the origin of the accepted histories. Califia Farms is a leading plant-based beverage company on the pursuit to return food to its original nourishing purpose. Founder and CEO, Greg Steltenpohl, was inspired by the legend of Califia, the beautiful black Queen who has come to be known as the “Spirit of California”. Queen Califia is both the symbol for the brand and its muse. Califia Farms shares her passion for protecting our environment, nourishing through the power of plants, and embracing diversity and inclusion. Adrienne Elise Tarver and her work embodies of the values of Califia Farms and the brand is a proud champion of Origin: Fictions of Belonging. Inspired by Buddhist teachings, the banners feature unique cloud artwork that creates an opportunity for visitors to become aware of nature and the environment of PULSE. The installation explores the idea that the things we see change our state of mind with the intent to promote calmness, an awareness of inter-connectivity, and an attention to the viewer’s relationship to time and the present moment via the visual vocabulary of clouds – the wildcards of climate change – which connote transitoriness. The balance between the transparency, opacity, and form of the lightweight and sheer silk chiffon play with visitors’ perceptions of light and materiality, while also creating a contemplative environment. TROPICOPHYA depicts the union of two vibrant places like Spain and Miami – separated only by water – to feature the rich cultural history, beautiful weather, and eclectic colors that are home to each place. The mural references several similarities between Spain and Miami including: water, vegetation, sun, fauna, and the most important, culture. The colors of TROPICOPHYA are drawn from the Spanish flag with imagery of flamingos and the column representing Spain’s cultural stability and homage to the sun. Spain's cultural and artistic richness is unique, brilliant and diverse. A luxury for the senses! It’s home to longstanding museums and renowned masterpieces by some of the world’s greatest artists including Velázquez, Goya, Miró, Dalí, and Picasso. Not only is this cultural history remarkable, Spain’s post-modern and contemporary art scene has also crystallized itself as vibrant and eclectic. Disparity, experimentation, intellectual curiosity, decomposition are a selection of words that aim to explain where Spain’s art is today and where it is heading. To that end, Spain is Part of You has supported the presentation of TROPICOPHYA by Antonyo Marest to bring the culture of Spain to live in Miami.